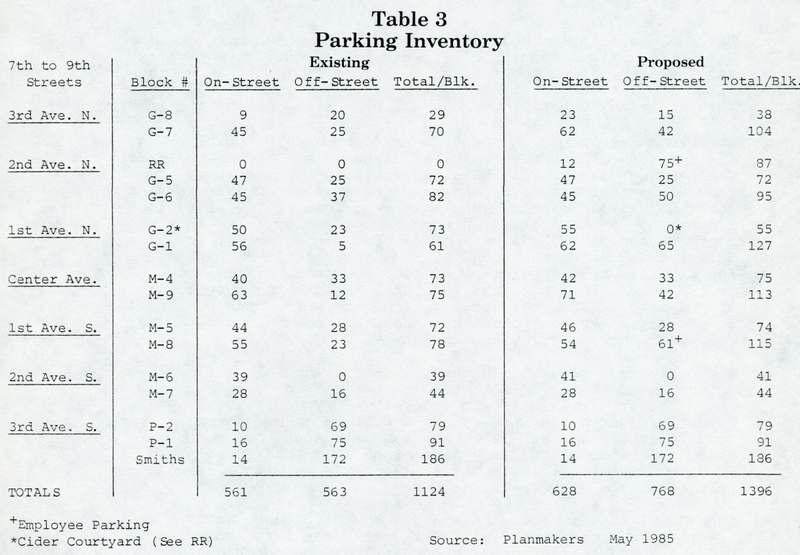 In May of 1985 an inventory of existing parking spaces was conducted (on a block-by-block basis) for both on-street (public) and off-street (private) spaces. 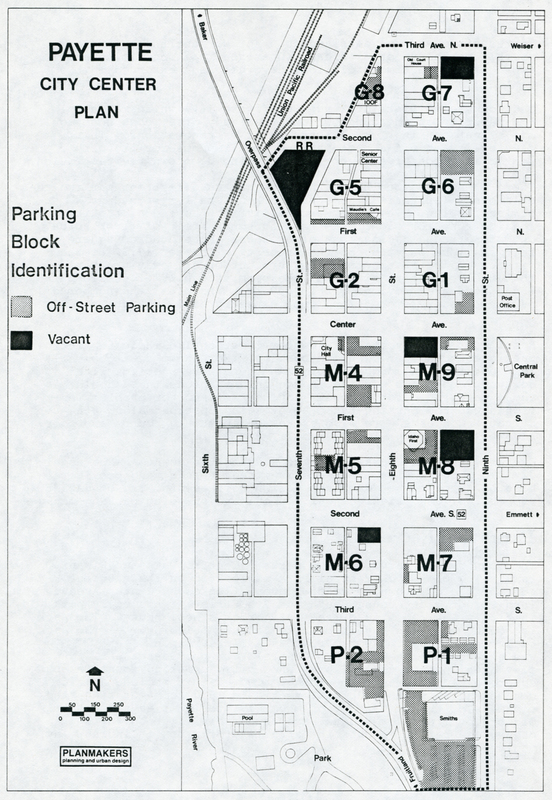 Figure 24 shows the location of off-street parking lots and Table 3 indicates the existing number of parking spaces in the study area. Currently, there are 1124 parking spaces within the fourteen block project boundary, with 561 on-street and 563 off-street spaces. Payette’s wide 100-foot street rights of way throughout the downtown allow room for angle parking stalls, good traffic circulation, and wide sidewalks. Typically, most downtowns in Idaho have streets that are eighty feet wide. With angle parking, Payette is in the enviable position of being able to provide a maximum number of on-street spaces for each block. Over the years, the city of Payette has tried a number of on-street parking options, including narrowing the sidewalks on 1st Avenue North and then striping for angle parking along the curb and adding parallel spaces in the center of the street. Use by patrons of the center street parking spaces has been infrequent over the years and does not warrant the expansion of this method to other areas. On-street parking limits are two hours. Overtime violations have not been enforced in the past. 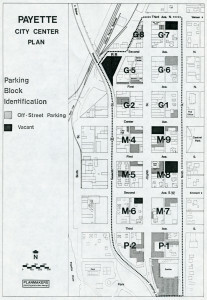 The Commercial District Zone (See Figure 16), which makes up the majority of the downtown and the study area, does not require off-street parking for new structures or renovations. This flexibility in off-street parking requirements for the city center is a positive factor, encouraging downtown revitalization. There is no city ordinance that designates off-street parking requirements for various uses and parking stall design dimensions or landscaping. The C. Commercial District zone does require a loading zone for each five-thousand square feet of floor space. One off-street loading zone of at least three hundred square feet shall be provided on the property. Chapter 17:32 of the city code also states that any curb cut or driveway greater than twelve feet in width will be permitted only if public parking spaces are provided within 300 feet and equal the number of parking spaces removed from public use by such curb cut or driveway. Results of the Payette City Center Questionnaire indicate little public concern over downtown parking. 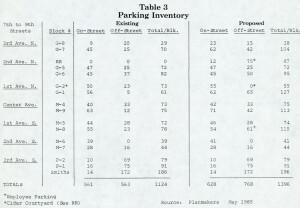 Merchants also generally felt parking was adequate but that there were problems with downtown employees parking in convenient spaces that should remain available for shoppers and users. Another problem mentioned was the parking taken up by saloon patrons along 8th Street. Concerns were also expressed about high curbs and poor sidewalks. Overall, the 1124 parking spaces serving the downtown are evenly divided between off-street and on-street spaces, and provide a base of support that requires design refinements, use of vacant properties, good signing, enforcement and on-going parking management.